Employee Motivation is crucial to your organization. It is the root from which stems both the progress and the downfall of your company. Employee Motivation can be defined as the attitude employees have towards their work. It is the desire and energy that makes people continually interested and committed to a job. It is what drives them, pushes them or “motivates” them to achieve or even show up at work every day. Employee motivation is important to your company. Motivated employees are dedicated, work harder and therefore, produce more. In other words, employee motivation improves the quality of work. Without a motivated workplace, a company can face major losses. An employee who does not feel motivated won’t be able to perform well. He wouldn’t want to give his best and work hard to achieve his goals. Motivated employees help achieve business goals. They also improve the overall productivity of the organization. In some ways, employee motivation affects employee engagement. An engaged employee is emotionally committed to the company. This commitment tends to influence his behavior towards the organization. And this attitude impacts his motivation to work. To explain this, Gallup did a research and found some disturbing results. It found that only 15% of employees worldwide feel engaged in their jobs. That’s right. ONLY 15%. What drives motivation for this 15%? And what about the rest of the 85% of the workforce? Why aren’t they motivated to work? Business Dictionary says motivation results from the interaction of both conscious and unconscious factors. Reward value of the goal. A meaningful reward at the end of their efforts is a great way to keep employees motivated. A reward should have a feel-good-factor attached to it. Thus, they feel motivated to push harder, work efficiently and produce better results. They have leaders whom they can trust. Leaders who value them and treat them with the same respect as they would to a senior employee. Leaders who believe in their capabilities & include them in important decision-making processes. Professional advancement is another important motivation at work. Employees are highly motivated to work if it means a career growth. Leaders who provide employees with opportunities to develop their career have better-motivated employees. 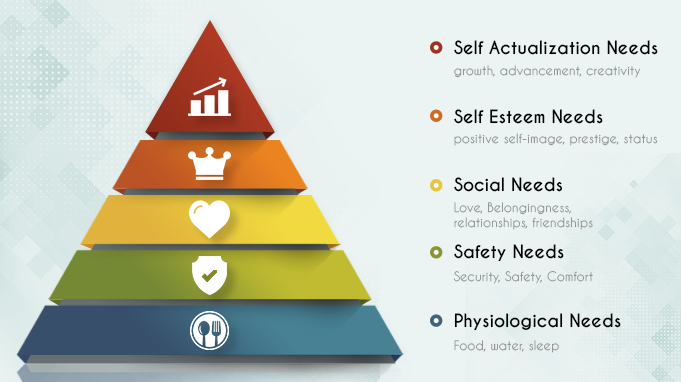 With the Hierarchy of Needs, Maslow highlighted that humans are motivated by needs. He classified the needs into a pyramid of five levels as per their importance and priority. He said when one need gets satisfied, it ceases to be a motivating factor. Once this happens, the next set of needs in the hierarchy order takes its place. He placed the needs into five categories – physiological, safety, social/ belongingness, self-esteem, and self-actualisation. The physiological needs cover basic needs like food, water, warmth, sleep. Next is the safety needs which is our concerns and cover comfort, security, and stability. Moving up, next is social needs which is the quest for love or belongingness. It includes friendships, relationships. The self-esteem needs are needs for a positive self-image, prestige, and status. 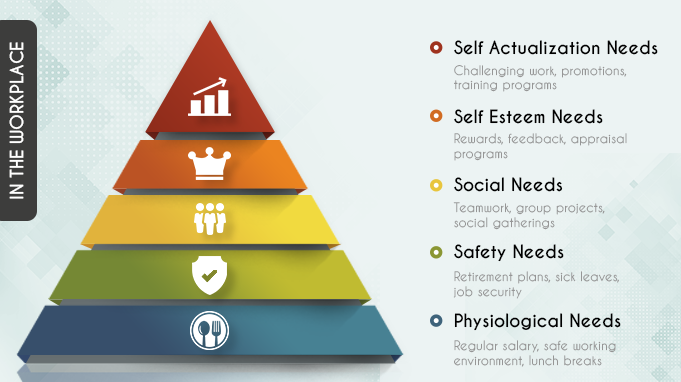 Finally, at the top of the pyramid are our self-actualization needs. This is at the top of our needs and deals with the desire of what one is capable of becoming. It is a feeling fulfilled through growth, advancement, and creativity. But, how do HR professionals use this to attract and retain talented employees? How can you****use this theory of motivation in management? Physiological Needs – Regular salary, safe working environment, lunch breaks, coffee/tea machines. Safety Needs – Retirement plans, sick leaves, health and wellness programs, insurance plans, job security. Social Needs – Teamwork, group projects, social gatherings to encourage communication among employees. Self-esteem Needs – Rewards to appreciate and value employees. Use feedback and appraisal programs to recognize them. Self-actualization Needs – Challenging work, promotions, training programs to advance their career and enhance their skills. A prominent concept in behavioral economics, nudge theory is a great way to boost employee motivation. It has been developed by American legal scholar Cass Sunstein and Richard Thaler, last year’s Nobel prize winner in Economics. 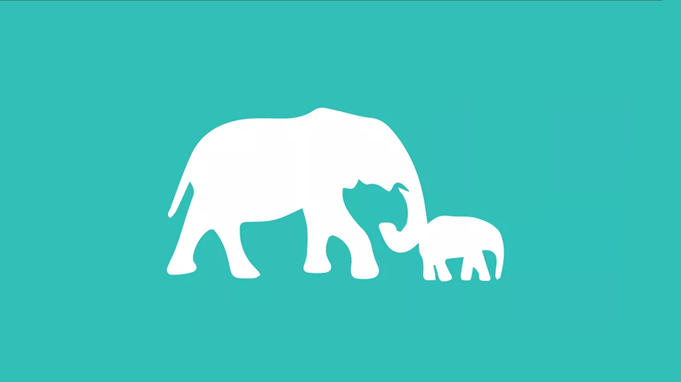 A nudge is any aspect of the choice architecture that alters people’s behavior in a predictable way without forbidding any options or significantly changing their economic incentives. To count as a mere nudge, the intervention must be easy and cheap to avoid. Nudges are not mandates. To put it simply, managers can change employees’ behaviors towards a certain something without forcing it on them. They simply “nudge” them or influence them towards the right decisions. This theory can be explained with how food is displayed. If you place healthy snacks at eye level while placing junk food farther away, you are nudging them to make a healthy choice. Sure, if they want to have junk food they’ll have it, but you are gently steering them towards the better choice. In human resources, managers use nudge in motivating employees to attend training. With training programs, you are helping them advance their career. You are nudging them with opportunities to hone their skills. They will then use these skills to increase the productivity of the organization. Another way to nudge is by influencing them to take up a healthy lifestyle. A great way would be by developing health plans, sports competitions and more. What are the types of motivation and how do these work in the workplace? There are two types of motivation in the workplace – extrinsic and intrinsic. Intrinsic motivation refers to motives which originate internally. It is the deep-rooted desires and the wish to fulfill them. The employee has the desire to perform a task because the results match his capabilities. Employees work more for their love for that task than money. This motivation arises when employees engage in a task because it satisfies them. Extrinsic Motivation, on the other hand, is driven by external rewards. This kind of motivation is most tangible in nature. External factors like money, fame, praise are used to motivate employees. When a known reward is tied to a task, employees are extrinsically motivated to do it. Employers provide extrinsic motivation in the form of pay raise and other benefits. The benefit of this motivation is you can make benefits direct and quantifiable. However, treating both these motivators as opposites would be wrong. Treat them not as opposites but as a combination. Not all employees will be intrinsically motivated from the beginning. But, you can provide them with tangible benefits to motivate them with extrinsically. This will ultimately lead to intrinsic motivation. Now that you have set up the company of your dreams and hired talented people, you need to hold on to them. And while money might seem like a good way to hold them, research shows it’s not enough. When we say office, the things that come to mind are rooms covered in white paint, cubicles, computers. This becomes mundane and boring. Employees don’t want to be stuck in such a place for hours. And they definitely don’t go “Wow” when entering such an office. You can change this. Change the way your office looks. Put in comfortable couches, paintings, plants. You can make it well-lit, paint your walls with cozy colors. In other words, design your workplace the way you’d design your home where your employees would want to spend time. Most of the times, employee-employer relationships turn sour because of miscommunication. Employees aren’t clear on what their leaders want. Employers get angry when they don’t receive the results they expect. So, the message I am trying to convey here is always be clear, concise and transparent. And you can start as soon as onboarding. When you hire them, let them know of the company policies, rules and their objectives. As time goes by, include them in everything you do that is relevant to them. Share data, let them know of the new things you’re planning to do, pass ideas. This will make them feel involved and keep them motivated. Appreciation is a fundamental human need. 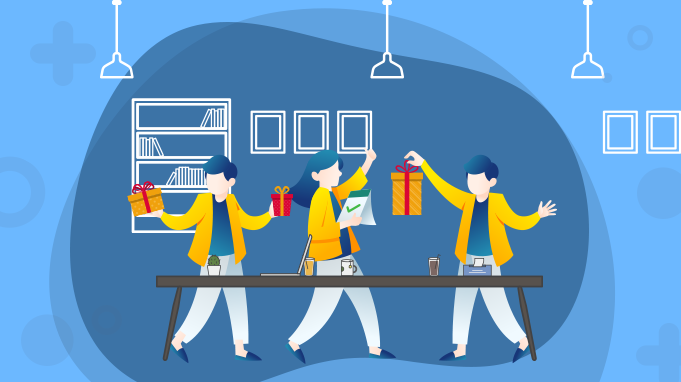 When you attach a reward to a work, everyone gets automatically motivated. Moreover, recognising employees for their efforts makes them feel valued. It also boosts employee motivation. This very morning, my boss said whoever could improve their blogs would receive a reward. And now, I am more motivated to make this my best article! Similar is the case with sports competitions. Players feel motivated to strive for the first position because the gold medal is the reward. It is the result of their hard work. It is what motivates them to work harder the next time. Peer motivation is one of the most effective forms of employee motivation. Employees form the culture of an organisation. And when you hire an employee, it is important to check if he/she will fit in that culture. Whether they’ll be able to work in a team, be helpful to others and engage in open communication. Moreover, employees are also each other’s biggest motivators. It is important that those working around you are supportive of you. That they appreciate your efforts, share praise and take responsibility of their actions. Timely appraisals and salary hike is an important factor of employee motivation. And while it is important, it is not always enough. In fact, research has found that 79% of employees would prefer benefits over pay raise. Moreover, with millennials entering the workplace, having a diverse benefits package is important. The reason – this generation focuses a lot more on the meaning of their work than the salary they get for that work. Therefore, providing non-monetary benefits is equally important. Some popular non monetary benefits are retirement plans, tuition reimbursement and more. Sometimes, your employees might feel clueless or unsure about their objectives and goals. Or if the work they do serves any of the goals of their life. Once the doubt sets in, employees are bound to feel unmotivated and dispirited. Vlad Moldavskiy of Mabbly, LLC says “I am able to motivate my employees by giving them a purpose.” He says this helps employees understand the company’s vision better. This in turn helps them understand their own purpose and how they fit into the culture. Taking care of all your employees is equally important. An organisation is its people. Thus, making sure that you recognise the efforts of each individual is crucial. Employees feel valued when they know you recognise and appreciate their hard work. They need to know that their individual efforts will help the company achieve its goals. Employees who know their contribution helps the company excel, feel motivated to work. To sustain motivation in employees, it is important that they be constantly motivated. One way to do this is by keeping work interesting. An organisation should work constantly to change the job design of an employee. Keep on adding new challenges and objectives for them to achieve. When you engage employees with new problems, they come up with new and creative ways to tackle that issue. This improves their skill-set, makes them more dynamic and adaptable to changes. Moreover, research also shows that lack of challenging work is one of the top reasons to leave a job. More than 30% of employees have stated this as their reason to leave a job. The only way to go to the top is by having a positive work environment. A positive work environment will increase employee motivation, keep them focused and dedicated. To sum up, when employees feel motivated, they feel engaged or emotionally invested. Engagement ensures efficient working which increases the overall productivity of the organisation.